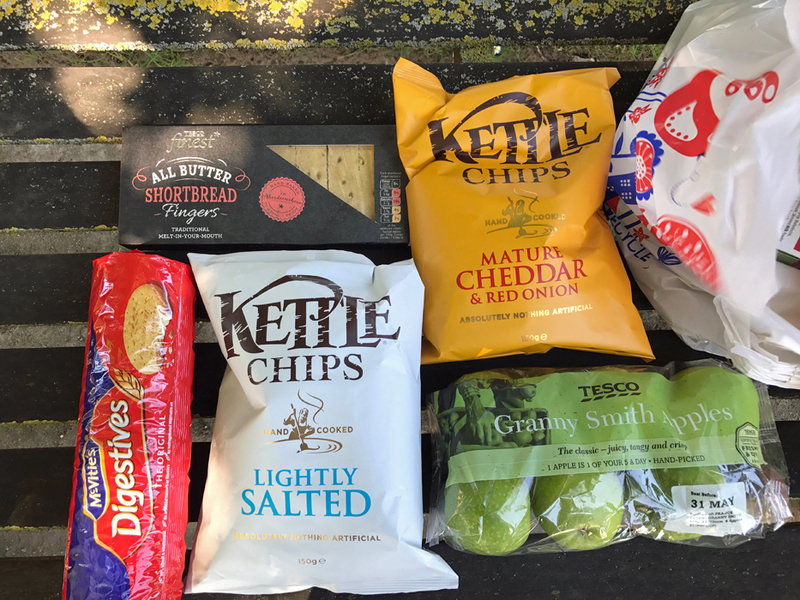 The Grocery Geek went to the UK for a month! Today I’m sharing a little bit of what we ate, where we shopped, and what we spent while traveling as a family of 8 for 31 days. (I hope you read that in my best Bert the Chimney Sweep voice.) We just got back from a month in the United Kingdom. Yep, a month. Six kids. 2 parents. $20,000. We lived to tell the tale. I’ll be posting about our adventure in more detail, including how we saved money and economized, over on Life as Mom, starting on Friday. You can follow that series here. 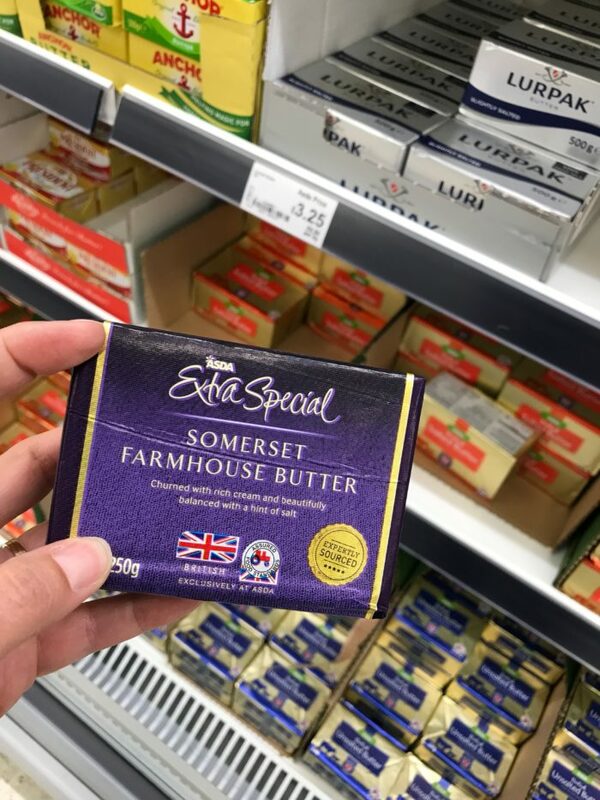 Today, however, as a wrap up to the month of June, I thought I’d share a little of my Grocery Geek experience in the United Kingdom. For the most part during our trip, we stayed in hotels. After we crunched the numbers and examined all our options, including serviced apartments and private home rentals, budget hotel rooms plus restaurant food/grocery store picnics proved to be our best options financially. Seeing as we were $10,000 UNDER budget for our month abroad, I’m going to stand behind that decision whole heartedly. When we did rent an apartment, we found that it didn’t save us that much money in food costs over bargain options because we had to buy things like oil, spices, etc. 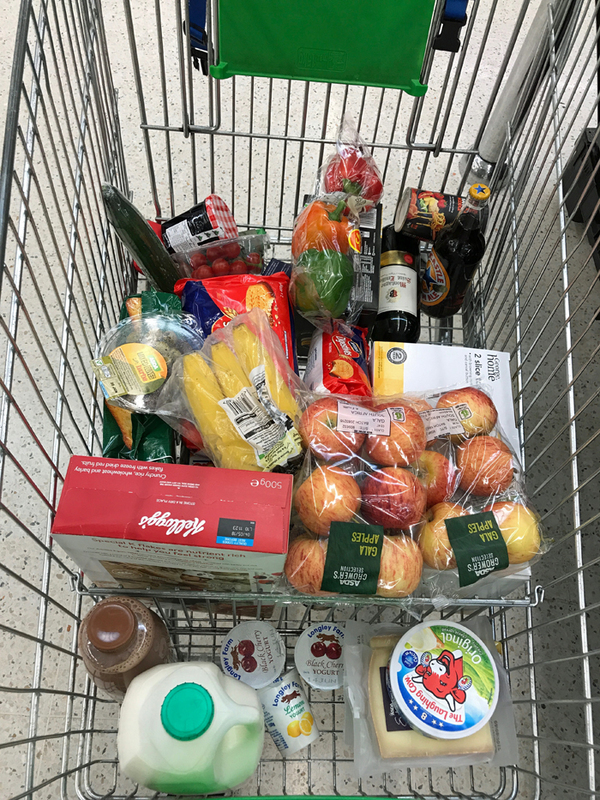 So what did our grocery shopping in the UK include? We are not too much into snack foods when we’re at home, but I knew that we’d need quick and easy things to pack in the car for outings and meals on the go. Digestives (similar to graham crackers) and apples were a regular staple. They were easy to transport and kept people going until we could get a real meal. We bought a cooler bag overseas since I forgot ours at home. Unfortunately, it wasn’t as good quality as the one at home on the kitchen table. Ice melted quickly, so we only shopped for a meal at a time. Not the most efficient, but having food go to waste is one of our pet peeves. A meal like this, with sandwich stuff, veggies, premade salads, and drinks ran us about 40 pounds ($51), about the same as a meal at a fast food restaurant without drinks. Despite the “strong dollar”, things were still more expensive than at home. One of my husband’s brilliant ideas was to buy a toaster (5 pounds at Asda). Since our hotel rooms already had hot water pots, we could easily make tea, coffee, and toast or crumpets for breakfast. Along with apples, bananas, and other fruit, it was really all we needed. We had salted butter that didn’t need refrigeration and occasionally bought a jar of jam. I would do this again in a heart beat as it worked perfectly for our family. In fact, I may have to buy a toaster just to take on trips stateside! We only have a toaster oven at home…. Before we left, I scanned the grocery store websites so I’d have an idea of pricing. Since I’ve been supplementing at least one kid’s caloric intake with chocolate milk, I searched that out, too. 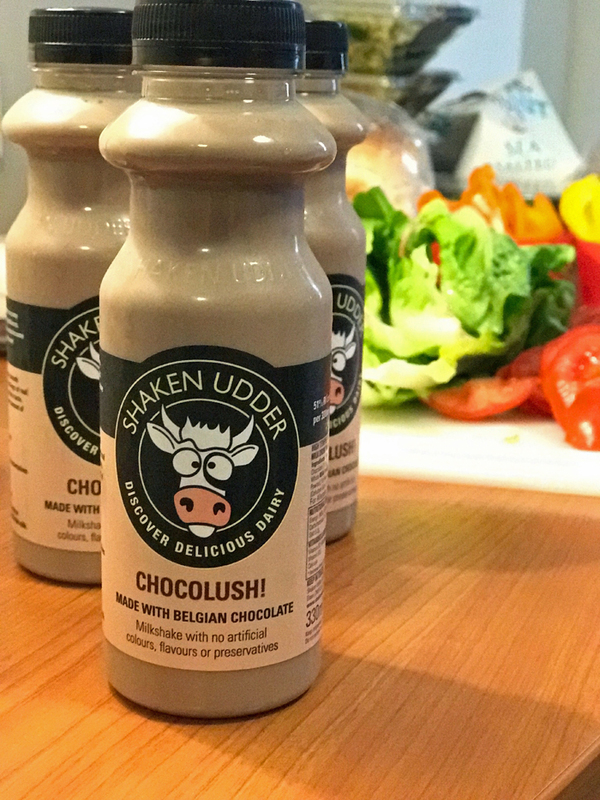 Did you know that chocolate milk is called a “milk shake” in the UK? Who knew? We got a good chuckle at some of the brand names and so it became a joke that we needed to find the Shaken Udder milk shakes. We finally did for one of our last meals. Such a fun memory for the kids! Where did we grocery shop in the United Kingdom? Where did we shop? Pretty much everywhere. We traveled to the following cities: London, Cambridge, Stamford, York, Newcastle, Edinburgh, Dumbarton, Preston, Keswick, Llandudno, Telford, Bourton on the Water, Bath, and Oxford. For most of those cities we had access to a car, so we were able to load up and haul things easily on our adventures. Stores where we shopped included: Sainsbury, Tesco, Waitrose, Londis, Asda (part of the Walmart group) and ALDI. By far, ALDI had the best prices, but like here, the selection, quality, and flavors of items were limited. Still, ALDI was my ace in the whole for saving money. How much did we spend on groceries in the United Kingdom? Thanks to a weak pound/strong dollar (which is it?) our money went a lot farther this time than when we traveled to Europe in 2014. Groceries were often quite affordable, if we shopped right. I didn’t always have a choice of where to shop, so prices fluctuated based on the store we found on our route. I ended up spending a little over $600 on groceries. However, our total food expenses were much higher. As you know, vacations involve dining out, trying regional specialties — yes, we ate haggis! — and sometimes having to choose something because time is of the essence. For instance, when your daughter falls into the York moat full of stinging nettles in spitting rain and you’re a long walk from your apartment? You just choose a restaurant so you can get everyone settled with dinner while you give her Benadryl and triage her welts in the bathroom which — lo and behold! — actually stocks paper towels, not something easily found in our travels. So, in the interests of full disclosure, we spent $3607 on food for a month, including bottled water, toaster, plastic dishes, and Shaken Udder milkshakes. Yes, that’s three times what we normally spend at home, but it was VACATION for a month for 8 people. I make no apologies. It works out to $15/person/day which isn’t too shabby when you’ve got FOUR teenage boys, eating their way through the UK. So, that’s the gist of it. We had a great time, ate well, and stayed under budget. I have a long list of recipes to test, inspired by our restaurant adventures in Great Britain, so stay tuned! We found prices in Paris to be outrageous like that. London had a wide, wide range. I could get a salad at the grocery store for 2 pounds or at a restaurant for 12. Same as here really. For the last few years, I have traveled with a toaster! My daughter likes breakfast as soon as she wakes up and doesn’t eat a lot of traditional breakfast foods. Peanut butter toast and fruit saves our family of three between $15-35 everyday. We are planning a trip to NYC next spring and we are thinking about using Amazon and have our order with a toaster and non-perishables waiting for us when we get there. The toaster was a game changer! When I was in NYC I went to a Whole Foods that was open early and they provided a microwave and toasters in their eating area. You may want to check if a good grocery store is within walking distance! My family is headed to Aberdeen and Scotland for 9 months. I was curious if you might share any tips about dealing with food allergies in the UK (pranuts/nuts). Wad it easy to find safe restaurants traveling to so many cities? We had no issues whatsoever. There were always things she couldn’t have, of course, but she ate well. We always communicated to the servers and read the chain websites to make sure it was safe. Zizzi and Nando’s both have good allergen menus. So neat! What were the kids’ favorite grocery foods? Probably the same as here: cheese, crackers, cookies, fruits. The chips/crisps were not often a favorite. The flavors there are much sweeter than here. Blech. Thanks! It sounds like a lot to me, so I’m thrilled to impress you. LOL! Buying a cheap toaster is a clever idea! 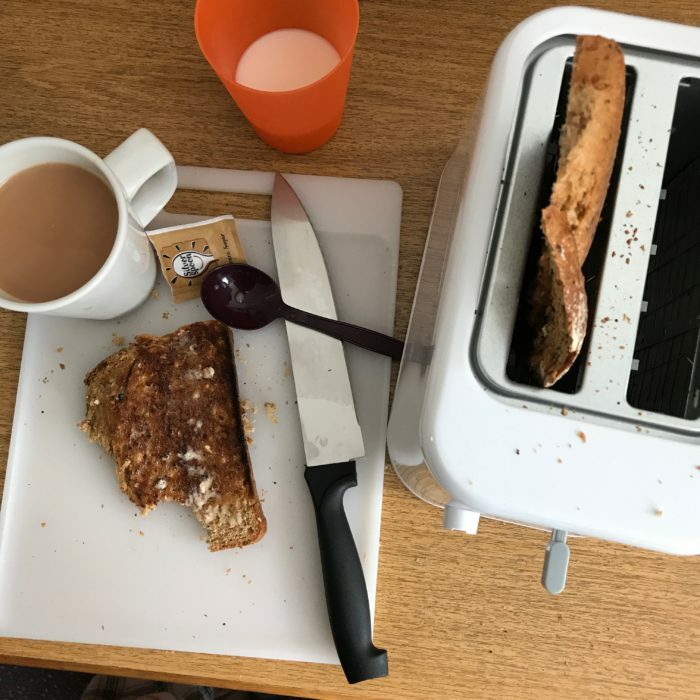 Last time we were staying in UK hotels we did similar to you (but without the toaster) – a loaf of bread, some butter and a jar of jam (all bought from the supermarket just up the road from the hotel) makes a pretty decent breakfast, especially when you don’t have a fridge. 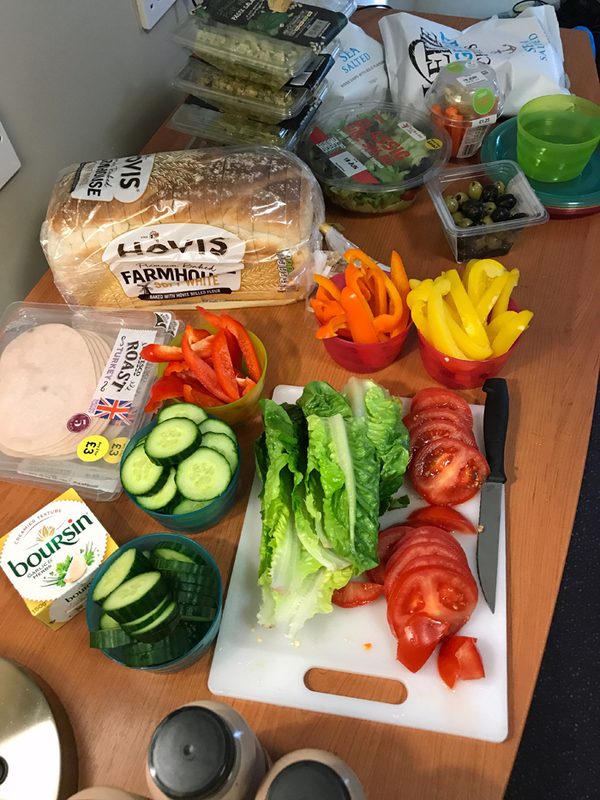 We also got some ham and cheese so we could make sandwiches to take out and about with us, along with fruit, crisps and biscuits – sooo much cheaper than buying prepackaged sarnies. I had packed some sturdy plastic plates, our 3 sets of travel cutlery and a travel knife – well worth the few hundred grams of luggage allowance, and they got very well used. I’m particularly interested in your views on Aldi. When I was last living in the UK, Aldi and Lidl were places you’d go for random bits and bobs, but they didn’t stock a wide enough range for a full shopping trip. Clearly that has changed. And we’re definitely going to keep our eyes open for Shaken Udder, I’ve not heard of them before and they look yum. My daughter has a big glass of choccy milk most days (it’s the easiest way to get calcium into her) so I’m sure she will be particularly keen to try it out! 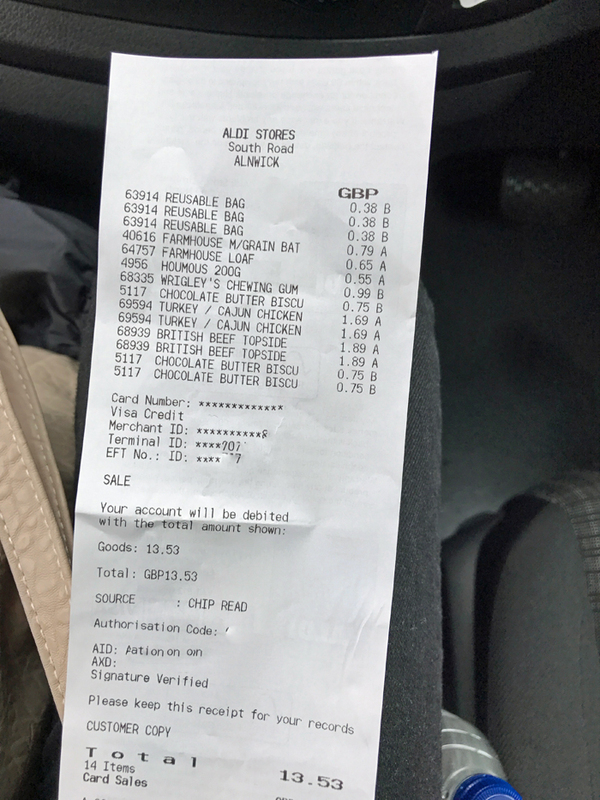 You could do almost a full shop at ALDI UK. Like here, I think there are some things they don’t carry. For vacation picnics, absolutely. But, they don’t carry Shaken Udder. lol. I cannot wait to read the whole series! I love the frugal tricks and grocery shopping.. Could you IMAGINE the bill if you ate out 3 meals a day….The lessons your children are learning are huge! There were some days when we did, thus the bill being as high as it was. But, we didn’t set out to have the cheapest trip possible, so it was okay. $3600 for food for 8 people for a month of travel is AMAZING! When you ate at the restaurants, how did they handle food allergies throughout the UK? Any allergen menus/listings like some restaurant chains have here? That makes me feel better. I was feeling bad that we spent so much. Everywhere we dined we communicated to the server and they were extremely accommodating. Zizzi and Nando’s are two chains we like a lot and they have great allergen menus. I’ve been eagerly awaiting this post! You did extremely well as far as food cost. Can’t wait for more details on where/what you ate and the places you visited. It is so life changing for kids to travel and see the world. It was a really good trip. I think we’re all still processing thought. So excited to read this, as my son will be spending next fall abroad for the semester in London and will not have a meal plan. He’s got a little bit of cooking experience but of course I’ve been worried about what he’ll eat and how much it will cost. I’ll let him know to keep an eye out for Aldi to do his grocery shopping. I did not see ALDI in London, but there are plenty of affordable grocery stores. I made lots of grilled cheese sandwiches when I was on study abroad in England (many years ago!). The students on my hall were always curious about my American cooking! That’s one of his favorites that the knows how to cook, so I’m sure he’ll be making a lot of grilled cheese. I did find some Aldi’s locations listed in London, but they’re all pretty far from where he’ll be. The Tesco and Sainsbury that were city centre were very affordable, I thought! Thank you for your honesty and I just want to encourage you for your thoughtful planning! I admire you! We are redoing our kitchen and I wish I would have planned better. After a long days work it is difficult to balance the desire for a spurge with the food I could make on the grill but don’t have the energy to get together. I love your story about just helping your daughter in the bathroom because it is so real. I wonder if we can be frugal for the occasional splurge. Or is that just my excuse because I’m exhausted as I type?!! I’m a big fan of the “be frugal for the occasional splurge” budget plan. Sometimes the desire for mental sanity has to surpass thriftiness. We are absolutely frugal so we can splurge — as well as stay in the black. I don’t think frugality is an end in itself. Staying solvent and enjoying life are more rewarding. What a great trip and congrats on coming in under budget! I’m sure that made the trip even sweeter! I love all your tips on how to shop while traveling with a large family for a month. I am all about eating breakfast in my room too when I travel. My staples are almond butter, banana, Nut Thin crackers and coffee. Love the toaster idea….brilliant! We are researching and thinking about taking a 2 week trip out West next summer (from TN) as a family of 5. We have never taken a vacation that didn’t involve staying with family or a friend’s place so I am having a little sticker shock. lol Can you point me to any bloggers who do break downs like you do of costs for a specific trip like this? Renting an RV from the east coast to head west? We really don’t want to drive our minivan…the biggest thing for me is comfort while traveling. Road trips with littles strapped in carseats for long periods of time is stressful but if we could swing an RV I think it may be much better! Thanks for any help! Julie , you might want to check RV share.com. It’s other RV owners that rent their RVS and are much more affordable than cruise America or other sites. We found a local place (we live in Boise idaho) and are renting a 27′ motor home for 6 days for $175 a day (sleeps 6). But that’s your bed and kitchen so you can cook and save money. We are interested in doing this as well. I wish I could help more. I love traveling to other places and finding names that may or may not be funny to the locals but are hilarious to us. That’s part of the fun of the vacation. The total amount spent is fairly mind-boggling to me for my current situation, but for the number of people and the length of time, it really is quite reasonable. Glad you had such a great time and happy to hear you avoided all the terrible things happening over there recently. Your daughter falling into the moat… sorry, I almost chuckled. How regular, real life that is. Welcome home! We absolutely laugh about the moat. It wasn’t funny at the time. She already struggles with so many allergies and skin issues, but even she can laugh now. And yes, the total boggled my mind, too. It was hard to find that balance of trying regional things at restaurants which is part of the experience and just feeding people. S15 per person per day on food? That is AMAZING! Especially since you were on VACATION! Wow! I don’t think I’ve ever pulled that off! I might try when we go to Disney next year. Sounds like a great challenge! Would be a great challenge at Disney! Having grown up going to Disneyland every year of my childhood, I don’t recall a single meal eaten there. We always brought a picnic. We still do! I’ve got several posts about that if you’re interested. Our meal plan was to eat each morning at a large breakfast buffet … Lots of protein & carbs and then snack along the way at Disney … We had a hard time getting our boys to eat while in the park, but getting them to eat a small snack was easier … Don’t forget the water bottles to refill along the way! When the Kid was younger, we would get annual passes to different amusement parks throughout FL and GA. (Not all at once, of course, I mean each year would be a different one and then we’d rotate back thru) We almost never ate actual meals at the parks. Like Maureen, we would eat large breakfasts before going to the park, have snacks during the day (and some parks gave a discount to pass holders which helped expenses), and then a normal dinner afterwards. Refillable popcorn buckets made the snacks less expensive, too. Some people did pack picnic lunches and just go back out to the car to eat; I thought that took too much time when there were just a couple of us but that might work better for those with a larger group. I haven’t done that in a few years, so I don’t know how much security changes might have restricted the snacks you can sneak in. Great strategies! Love the popcorn idea. Re: parks, at least in CA, they don’t care anymore that you bring food. They just want to know you don’t have a knife, a gun, or a bomb. At Disneyland they ask that you get a locker and eat in the designated picnic areas, but we’ve never had a problem eating our own food in the park. This is probably my favorite edition of Grocery Geek! What an amazing trip that must have been. It sounds like you did an amazing job with your budget, such an encouragement. It just shows that you CAN have an awesome vacation and still be frugal. Thanks Jessica! You’d be surprised at how much grief I’ve gotten from sharing the numbers. Haha. But, when you do the math, it’s really not an extravagant trip. I wonder how many people travel and charge the card without really looking at what they were spending. Our son & daughter live in Islington. You are making me tear up, thinking of the many grocery shop adventures we have had in London. I love how fresh the fruit and veggies are in the middle of winter. My son is an Aldi addict and the ASDA stores are huge! There are ALDI stores in London; just a wee bit out of the central area. I also was overwhelmed by the pound stores … Amazing selections! Thank you for a little reminder of our visits; my husband leaves in 2 weeks for a holiday! We just returned from two weeks in Iceland. Food was crazy expensive there (a burger & fries averaged about $26.50 US, a small, personal sized pizza about $21). All of our hotels had breakfast buffets, and we would first fill up on breakfast, then assemble a little sandwich from breakfast offerings for lunch. Supplemented with a stop at the local grocer (Bonus is the name) for chips, fruit, etc. Always had bread, peanut butter & Nutella in the car for snacks. We ate dinner out about every other day. On off days, would either have a second picnic supper or grab a pre-made sandwich from the grocer. We went for the scenery, not the cuisine, so this worked for us. On the plus side, meals are not taxed and it is NOT the custom to tip (we asked – several times – and were assured the wait staff was well-compensated and did not expect tips). How great that the hotel let you take sandwiches for lunch! Awesome strategies! I would love to visit Iceland sometime.